This tactic seeks to create networks, foster entrepreneurship, and build partnerships between different social and entrepreneurial organizations. Our objective is to activate the neighborhood streets, promoting the meeting of different organizations and micro-entrepreneurs, in order to create a space where those who wish to participate can showcase, market and / or exchange their products, presenting their work and promoting collaboration between neighbors. At the heart of the activity lies the Flea Market organized by the residents of Villa Las Condes, in the city of Antofagasta. The market is complemented by a host of recreational and leisure activities for all ages with includes stands for entrepreneurs and social innovation initiatives. The Innova-2 (innovated) organization of the Universidad Católica del Norte - a group formed by 60 high school students from different establishments of the region of Antofagasta who, through stands and workshops, presented the neighbors with entrepreneurial projects related to issues of waste reuse, recycling, community development, education, health, immigration and cultural development. They stressed composting initiatives, production of soaps based on arid climate vegetables and bio-filter projects to improve water quality to list a few. At the same time, the Ecoviandantes Brigade of the Liceo B-13 set up an explanatory stand for the days of participatory cleanings and the Triciclos company implemented a mobile recycling center system with five different containers presented in a lively talk on recycling. In addition, the School for Social Innovation and the local organization Nuevo Arte, who participated in the event with a stand that showcased their work to those interested in the fair. This work was in line with the reuse of waste, demonstrating practical and creative ways of reusing some of our waste and transforming them into useful accessories, fostering entrepreneurship amongst neighbors. 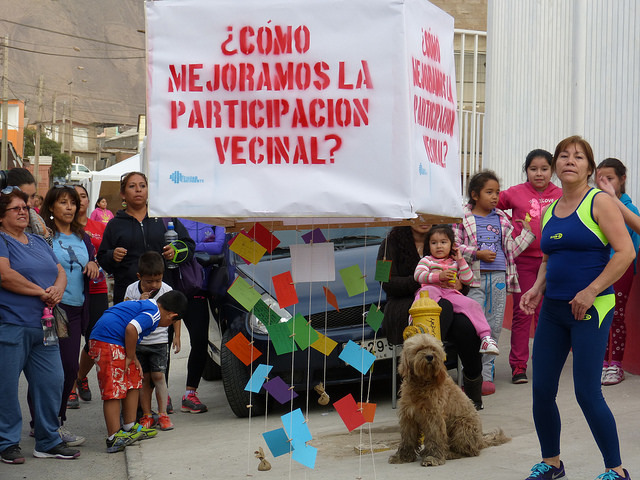 Citizen Fairs seek to energize and encourage neighbors to activate their streets through activities that promote cultural change in the way we care for public spaces and build networks that improve the quality of life in neighborhoods. Check out more pictures on our FLICKR account!